ACI 308R-16 Guide to External Curing of Concrete refers to curing as “Curing is an action taken to maintain moisture and temperature conditions in a freshly placed cementitious mixture to allow hydraulic cement hydration and, if pozzolans are used, pozzolanic reactions to occur so that the potential properties of the mixture may develop.” Spray-Lock Concrete Protection (SCP) products work by penetrating into the capillaries and voids left in concrete as bleed water exits. Once in the concrete, SCP products react with available alkalis to form Calcium Silicate Hydrate (C-S-H), the same reaction product provided by cement hydration that provides most of concrete’s desirable properties. The reaction products formed fill capillaries and shut down liquid water transmission. This action makes SCP products an effective waterproofing agent, even under hydrostatic pressure. The action works in the other direction as well, holding in water that would normally evaporate at early ages. By making the water that would normally evaporate at early ages available for continued hydration, SCP products meet ACI’s definition of curing. 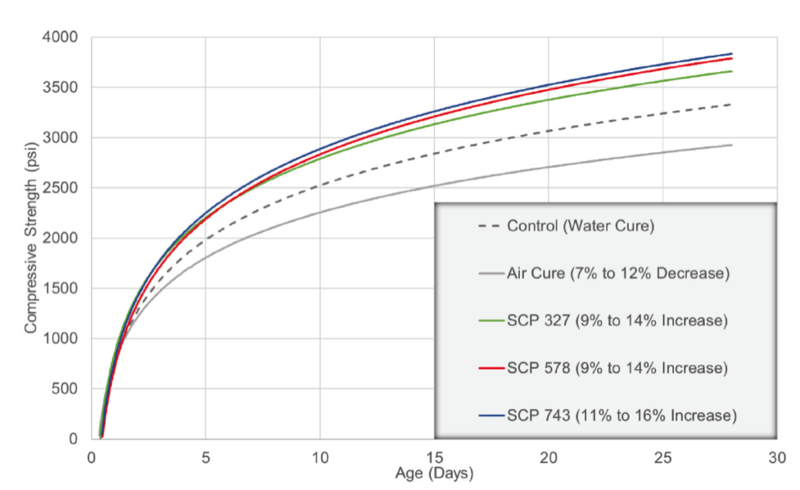 Evidence of the continued hydration is drawn from the fact that SCP products improve concrete’s compressive strength and reduce drying shrinkage significantly, even when compared to moist-cured samples. Because SCP products penetrate into the concrete, they do not form a surface membrane. Therefore, the ASTM test methods and specifications (ASTM C309 and ASTM C1315, respectively) do not apply to SCP products. An important consideration when evaluating products for use with concrete is that ASTM develops standards to generate performance numbers while ACI writes the guides and specifications that are used to put the numbers generated into practice. At least two ASTM C09 subcommittees are currently working on standards to better evaluate the performance of colloidal silica. Until those standards are available, and ACI 308.1 can be updated to reflect those standards, the ACI guidance in ACI 308R-16 on curing describing the desired effects must take precedence. According to ACI 308R-16, when determining the duration of curing, consideration should be given to the concrete properties that are desired in addition to compressive strength development. “For example, if both high compressive strength and low permeability are required concrete performance characteristics, then the curing needs to be long enough to develop both properties to the specified values. The appropriate duration of curing will depend on the property that is the slowest to develop.” By providing a permanent barrier to water migration, SCP products maintain curing indefinitely. In other words, the semi-evaporable and non-evaporable water continues to be made available for hydration until it is consumed or an equilibrium state is achieved when SCP products are used. While membranes degrade over time, and water ponding methods cannot be continued indefinitely, the use of SCP products provides a continuous curing environment. 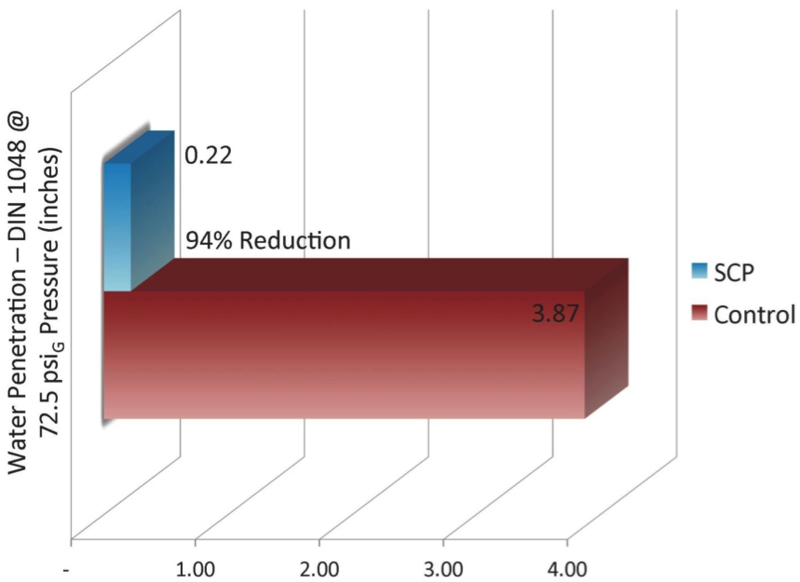 Figure 1 above shows the percentage of strength gain associated with various curing methods. SCP products will allow concrete to generally follow the “moist-cured entire time” trendline with values that are typically 7-16% higher. Figure 2 shows the performance of concrete treated with SCP products versus air and moist cured concrete. Compressive strength development is the primary reason curing of concrete is required, and SCP products help achieve even better performance that moist-cured concrete, long held as the gold standard of curing concrete. 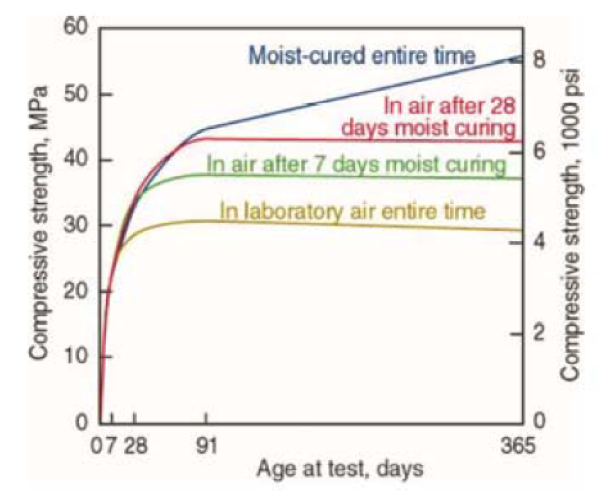 Figure 3 below shows the performance of treated concrete tested for drying shrinkage, another important reason curing is required, demonstrating improvements over moist-cured control samples. Figure 4 shows the performance of treated concrete in water permeability testing in a hydrostatic pressure environment, another reason curing is often called out. ASTM C309 membrane-forming curing compounds were developed as a solution to the need for a time-saving alternative to water ponding. They are widely recognized as providing “adequate” curing, but are not seen as equal to water ponding or water-saturated coverings. Additionally, SCP products become a permanent part of the concrete while membranes and water ponding are temporary. 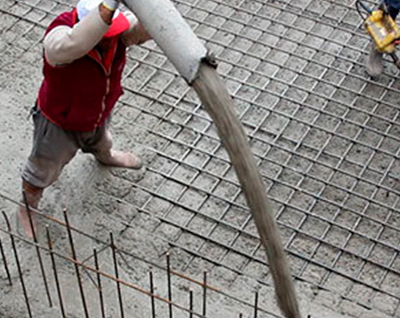 The objective of curing is to allow the concrete to meet performance parameters; SCP products produce those performance parameters at a rate equal to or better than moist curing. ACI 308.1-11 Specification for Curing Concrete section 1.1.2 Exclusions allows designers to stipulate special curing procedures not covered by the specification. Instead, refer to SCP’s example specifications for its products and incorporate them as needed.